Medically referred to as a hordeolum, a stye is an infection of the oil glands of your eyelids. The infection will lead to the formation of a firm, red lump on your eyelid. Makeup, dirt, or other debris may infect simply block the oil gland to cause the condition. Staphylococcus bacteria most often cause it – it is usually the culprit in about 95% of cases. If you already suffer from a condition called Blepharitis, which results in the inflammation of your eyelash follicles, you are more likely to develop styes as well. Stress, poor hygiene, and hormonal changes may also contribute to this problem, but the good thing is that you can make use of certain home remedies for styes to correct this issue. It is worth mentioning though that you will need to select a remedy carefully when your stye fills with pus and starts looking more like a pimple on your eyelid. The outer edge of your eyelid is the most common site for a stye to develop, but it may appear on the inner region as well. Its symptoms include swelling, pain, burning sensation, tenderness, difficulty blinking, itching, mucus discharge from your eye, and increased sensitivity to light. The condition usually clears in a couple of weeks, but you can try an effective home remedy for stye to trigger recovery and make symptoms more manageable. Before you actually opt for some stye home remedies, it is a good idea to start with basic care. You can take the following steps to make your condition manageable. Don't touch your stye and never try to pop it. This won't resolve the issue and may even cause the infection to spread. Running warm water over a clean towel or washcloth and then placing it on your closed eyes will help relieve pain and itching. Repeat the same process after every 15 minutes or so. This will help your stye to drain on its own. Avoid wearing any makeup until your stye settles down again. Avoid wearing your contact lenses because the bacteria may stick to your lenses and spread. A number of home remedies for styes are now available to help you make your symptoms more manageable and even encourage faster recovery. Due to its natural anti-inflammatory properties, green tea will work amazingly well to reduce inflammation and pain. It also contains tannic acid that will keep your infection from spreading. Several antioxidants in green tea promote healing. Take a green tea bag and dig it in warm water for several minutes. Take it out, remove the excess water from the tea bag and place it directly over your affected eyelid for five minutes. Repeat the same several times a day until there is no pain. You can make your stye to disappear fast by using turmeric that has natural anti-inflammatory and antibacterial properties. It also proves beneficial against infections. Take two cups of water and add a tablespoon of turmeric to it. Boil it until it comes to its half. Let it cool down for some time, strain, and wash your affected eyelid using this solution. Repeat it thrice daily for several days for relief. Aloe vera is among the best home remedies for styes because it has natural antibacterial, anti-inflammatory, and soothing properties. Its regular use will help reduce swelling, redness, and inflammation. Extract the gel from a fresh aloe vera leaf and rub it directly on your stye. Leave it there for about half an hour and wash it off with lukewarm water. Repeat it a few times a day for a week or so. You can rely on potato for stye relief because it contains astringent properties and contracts the tissues, which in turn will reduce skin irritations. It will also reduce your pain and inflammation. Take a medium-size potato, grate it, and wrap those grated pieces in cheesecloth. Place it directly on your affected area for about 10 minutes. Repeat it twice a day for four days. Guava leaves have natural healing power and work efficiently to remove styes. Thanks to their anti-inflammatory properties, they can be extremely effective in reduce inflammation and redness caused by styes. Wash a couple of guava leaves in hot water. Soak a cloth in this water, wring out the water, and get the leaf out of it. Place it directly on your stye for five minutes. Do the same with other leaves. Get one leaf out of water at a time. Doing this twice a day for four days will help. Garlic can prove effective in treating your stye because it can heal infections due to its antibacterial properties. Slices of onions placed on your stye will also help reduce inflammation and pain and even trigger the healing process. Simply placing an aloe vera leaf cut along its length will help. Be sure to place the fleshy side on your affected area. Take a cup of water and add a teaspoon of coriander seeds in it. Let it boil for a few minutes. Let it cool down a bit and use this solution to wash your eyelids thrice a day. You will find relief from home remedies for stye, but if your stye is causing severe pain, you may consider using a non-steroidal anti-inflammatory drug for relief. Using ibuprofen or aspirin for the first few days may help. 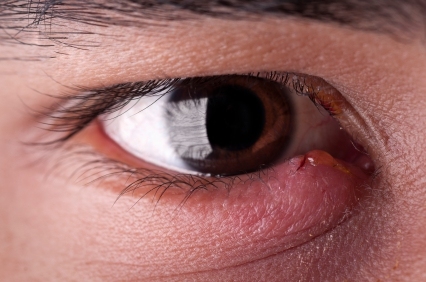 Your doctor may recommend antibiotics if your stye isn't responding to natural home remedies. This may involve applying a topic antibiotic cream or using antibiotic eye drops. Most styes are quite harmless and respond quite well to conventional home remedies for styes, but sometimes, self-care measures won't work. You should see your doctor if you notice no improvement after 48 hours or swelling and redness go beyond your eyelid and reach your cheek as well. Server responsed at: 04/25/2019 8:34 a.m.